I have just returned from an extended trip to the Southern Hemisphere, where I enjoyed the warmth and the light. I love to escape from the harsh weather conditions of the Northern Winter. 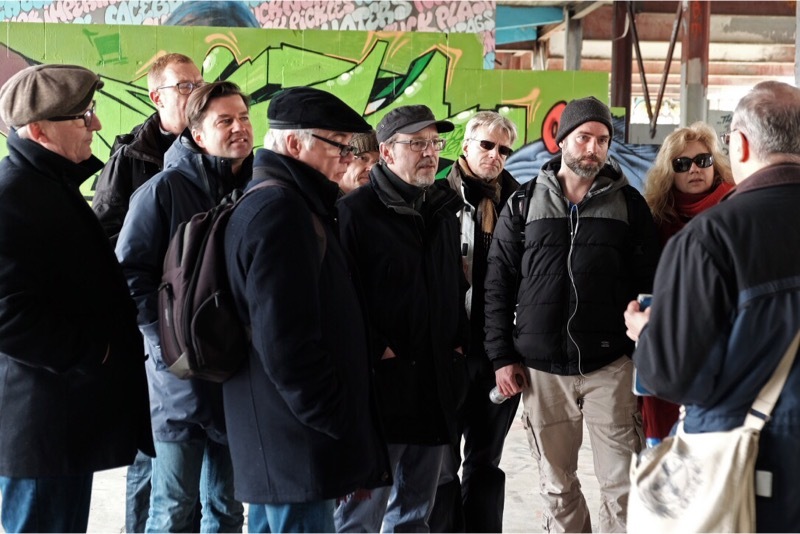 I got back just in time to participate in one of the educational tours organized by DriverGuides Berlin. We refer to these events as “The Academy“. This time the object of our interest was the Teufelsberg (“Devil’s Mountain”). It was hard to access for a long time, as it was the main spy station of the Allies in Berlin. We were able to hire an American, who had worked on the Field Station in the 70s, during the Cold War. What we got were real insights into what spying was like at that time and a good overall history of the place. In comparison to many world-known sights I have seen on my travels, e.g. 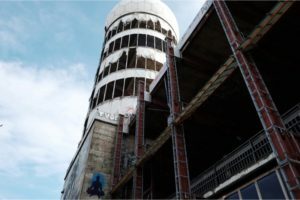 the Knossos Palace or the Forum Romanum, I found that the Teufelsberg is in fact an excellent example of a site that holds not just one “main” significance. In fact, at least four aspects of historical and contemporary significance can be distinguished. The first aspect is its location in the westernmost part of Berlin. This large forested area was once to become a gigantic Nazi Military Academy. Planned by Albert Speer, it was Hitler who laid the founding-stone in pre-war 1937. It was never finished. With the end of WWII in 1945 the buildings were demolished. Now a part of the British Sector, the site was chosen as a dumping ground for the rubble from the bombed-out ruins of Berlin. A huge fleet of lorries was deployed, which, in some 20 years, piled up more than 25 million cubic meters of debris. It grew to be a considerable man-made heap. Though it was not the only “rubble-mountain”, it grew to become Berlin’s highest elevation, reaching some 120 meters in height. And as such, the location soon turned out to be the most ideal place for an Allied forces listening post. 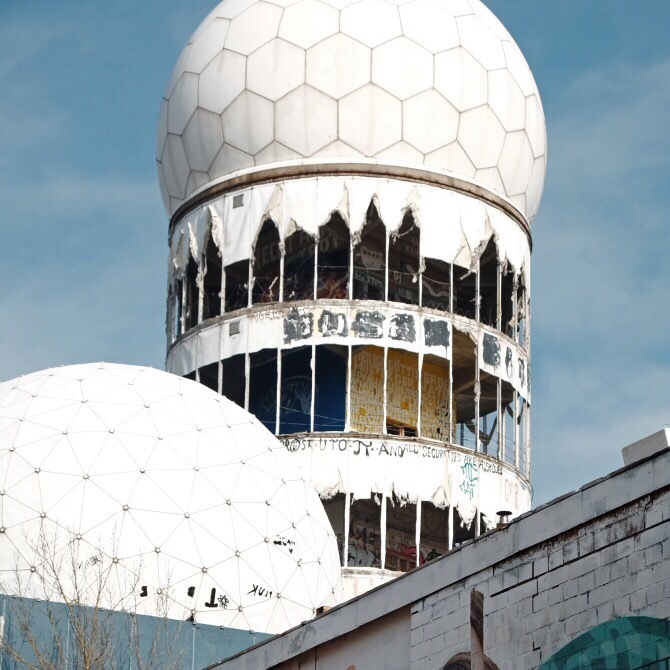 In fact, from 1972 onwards, TEUFELSBERG became THE western worlds’ most important spying facility during the cold war. To be able to run a full blown spying post in the midst of the enemies’ territory, i.e., surrounded by half a million Russian and East German forces, was a spectacular aspect that can still be felt on the site today. The site’s post-reunification development began in 1990. The spying tools had become obsolete and were dismantled. Replaced for a while by civil aviation radars the site was later completely abandoned. 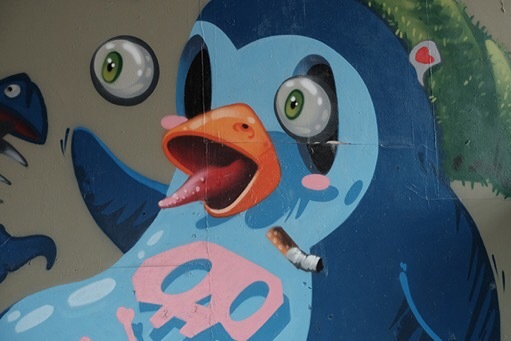 These days however, the Teufelsberg has entered its fourth stage of development. It not only provides fabulous views of the city and the surroundings, its buildings have now become a playground for international street- and graffiti artists. The former main tower with its several floors affords multiple giant screens for the display of contemporary works of art, ranging from small to very large productions. Only recently the site has been made accessible to visitors. An entrance fee of presently 8 Euros is to help to pay for the maintenance and development of the facility. The guides of DriverGuidesBerlin are anxious to go – or rather drive – up there with you as part of a Cold War Tour, for example, and share with you some truely astonishing spy stories and one of the most magnificent views over Berlin.